Green energy policies are focused on using energy generation, energy conservation, energy storage, and smart systems integration to provide a stable supply of energy, developing green-energy generation, and assuring sustainable operation and carbon reduction so as to achieve energy security, a green economy, and environmental sustainability. The government has established the vision of a non-nuclear homeland by 2025 and aims to boost the share of green energy in total electricity generation from 4.8% in 2016 to 20% in 2025. A 2-year plan for photovoltaic energy and a 4-year plan for wind power will be launched to stimulate the development of related industries. Taiwan's photovoltaic capacity is targeted to reach 20GW and installed wind power capacity to reach 4.2GW by 2025. Construction of the Shalun Green Energy Science City is a key goal of green energy policy. The building of this green science city will stimulate the development of a creative environment for industrial innovation and help integrate development in four key areas: energy conservation, energy generation, energy storage, and smart systems. According to a survey conducted by 4C Offshore, an international offshore energy consultancy, Taiwan has abundant potential offshore wind energy with some of the world's best wind-power resources being located in the Taiwan Strait. Taiwan is a world leader among manufacturers of photovoltaic cells. In other sectors of the industry, including current inverters and storage systems, Taiwan could build up these high-tech industries through transnational cooperation. 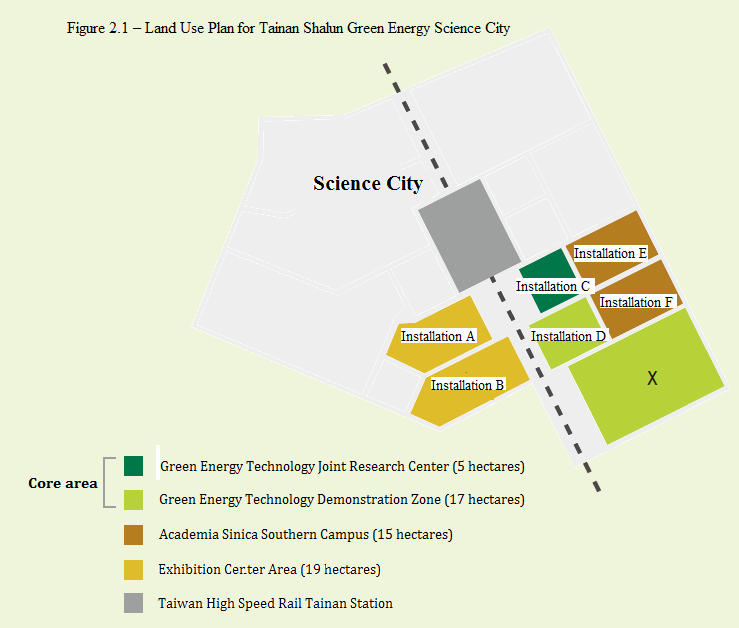 The Shalun Green Energy Science City will create an ecosystem for the nurturing of green energy innovation by building up an integrated up-, mid-, and downstream industrial chain that encompasses everything from a joint green energy technology R&D center and green energy technology demo site to a green energy industrial cluster and eco-city. This will provide an outstanding environment for the development of green energy technology, stimulate the innovative application of green energy, and create market opportunities. Cooperation among the industrial, academic, and research sectors in Taiwan has already yielded 9,000 R&D results. Cross-domain value-added applications will continue to be promoted and international cooperation in R&D projects will be pursued with the aim of expanding the scope of green technology applications. Taiwan provides a 20-year preferential feed-in tariff rate for the purchase of electricity generated by renewable power, offering a stable and reasonable return for developers. (1) Taiwan has set a 2025 target for green energy installed capacity; this will stimulate US$60 billion of investment in green energy installations by that year, and spur opportunities for investment in related fields. (2) Through an amendment to the "Electricity Act" passed in January of 2017, Taiwan now allows free trade in renewable electric power to encourage liberalization of the market. (3) Taiwan wishes to attract investment from foreign manufacturers in the areas of blades, gear boxes, and power generators for offshore wind power turbines; power systems, chassis systems, and whole vehicle systems for electric vehicles; as well as converters and storage systems for photovoltaic energy. (4) Taiwan's government is implementing a "Forward-looking Infrastructure Development Program" that encourages investment in green energy (prioritizing photovoltaics, offshore wind power, and the construction of facilities supporting related research and long-term development). Based on domestic needs, Taiwan will attract domestic and foreign investment to transform itself into an important base for the green energy industry in Asia. (1) The government has announced 24 sites in the Taiwan Strait for which interested foreign and domestic companies can apply to invest in the installation of offshore wind power generation facilities. 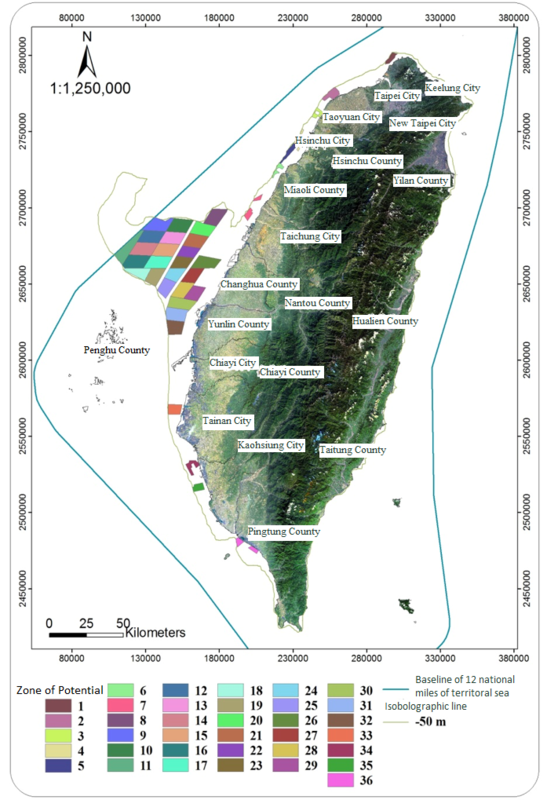 (2) The government is evaluating the west coast of Taiwan for sites suitable for the construction of heavy cargo wharfs for the exclusive use of offshore power generation work, as well as a site for an industrial park to support the manufacture, assembly, construction, and maintenance of parts and components related to wind power generators. This will provide a complete and integrated industry chain to support offshore wind power generation facilities. (1) Taiwan aims to increase its photovoltaic energy supply to 20GW by 2025, bringing opportunities in the supply of about US$4.33 billion worth of large inverters. (2) The demand for photovoltaic power storage systems is expected to grow steadily after 2020, providing a favorable environment for Taiwanese and international energy storage system manufacturers to engage in joint ventures. ​The government is promoting fully electric transportation vehicles with the aim of producing 45,000 electric motor scooters, 2,500 electric passenger cars, and 4,400 electric buses annually beginning in 2020. (5) For operators stationed in Export Processing Zones, Science Parks and Free Trade Zones, imported raw materials, fuel, materials, semi-processed goods, and machinery may be exempt from import duty, commodity tax, and sales tax. The business tax rate on goods and services shipped abroad from such areas is zero. (4) Industrial Upgrading and Innovation Program: For companies having R&D teams in Taiwan, subsidies are available for 40%-50% of funding for projects that conform to government programs and up to 40% of funding for projects generated by the applicants themselves. Macquarie of Australia and Dong Energy of Denmark invested in Swancor of Taiwan to gain entry to Taiwan's offshore wind power generation market. WPD, a German energy firm, will invest in land-based and offshore wind power generation as well as photovoltaic solar power generation. Eolfi of France will invest in floating offshore wind power generation. With regard to the current status and the progress of wind power in Taiwan, please click the links below provided by Bureau of Energy of the MOEA to see more details.